Sunday evening. This is the first truly cold night of the season. The outdoor air sniffs with sleety snow. Ice glazes the fallen leaves restng on the cold ground. I’m back in after hanging the last storm windows. (My house is an old one, and the windows are original. Every fall the screens come down, and storm windows are toted up to block the winter winds.). Now I’m sitting by a roaring fire – I have a bit of catching up to do here. Things have taken me away from posting, and also from shooting. Lately, the days I spend in the field are rare, and whatever results come from those trips are all the more precious. I missed most of the local fall color. One trip into the Allegan Forest resulted in one shot of one maple tree. I could find the place again, but don’t remember the names of the roads and trails that brought me there. Fortunately for me I had packed up the Pentax 6x7 and several rolls of Kodak Portra VC 220. The negative, scanned at 6400 dpi, creates a huge file that could produce an enormous print. One token from this autumn. Otherwise – I missed the season. In late October I traveled to New Jersey to handle some business. After two weeks there I returned to Michigan only to find that the season had turned. Nonetheless, I set aside one day this past week to get out and enjoy a few of my favorite places. Firearm deer season stated yesterday, and no sane person (who isn’t also hunting) would head into the woods at this time. Of course, on Wednesday I visited the old farmstead with its seasonal marsh. The old farmstead is one of the few fields that has not been mown this year. I guess it’s on the list for mowing next year. 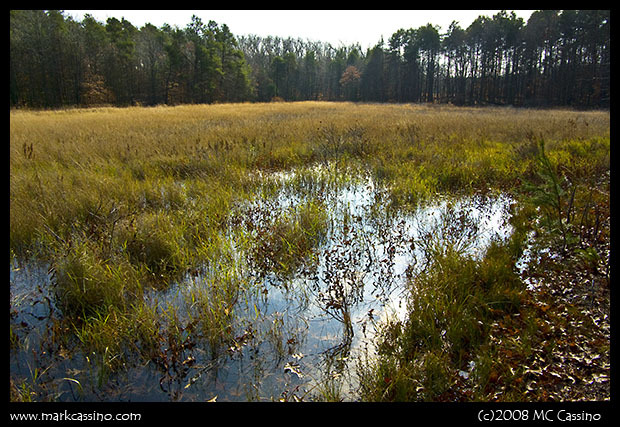 The seasonal marsh would normally be rebounding in November, and this year is no exception. However, two summers of very wet weather have left the marsh more full and wet than ever. It’s a bit of a walk from the parking area down to the marsh. The field is buffered by dense, scrubby woods on all sides, so the only access point is a small parking area, big enough to barely hold two cars. Around d this small area, railroad tied are driven vertically into the ground to keep vehicles out of the field. There is a distinct trail in the vegetation leaving from the parking area. It winds due east, and heads into the woods along the far eastern side of the field. The marsh is to the south, and that’s where I went. Here’s a shot that shows the current water level – hard to believe that just a couple of years ago, I was able to walk through this area without getting my feet wet. The heart of the marsh, which was once full of cat tails and other vegetation, has vanished. Too much water for the cattails, and just open water in that small area. The marsh, of course, is home to many dragonflies. The skies were cloudy and cold early in the day, and the early forecast called for light rain. 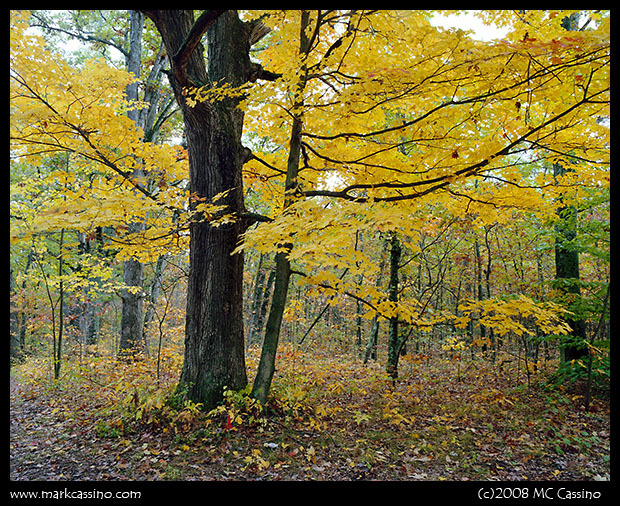 I visited a few places in the Allegan Forest under an autumnal chill. But shortly after arriving at the old farmstead, the skies cleared and warm sun bathed the landscape. I didn’t even bring my insect macro setup. It was so late in the season, I thought for sure that all dragonflies would be gone. But here it was, November 12, 2008, and the Autumn Meadowhawks were still out. After spending some time around the marsh, I returned to my car. It was mid afternoon. The wind picked up and a few high clouds were starting to obscure the sun. The day’s warm temperatures were the result of warm air riding in front of a coming cold front. As I hiked back to the car I realized that in a few days the ground would be covered with frost and snow. 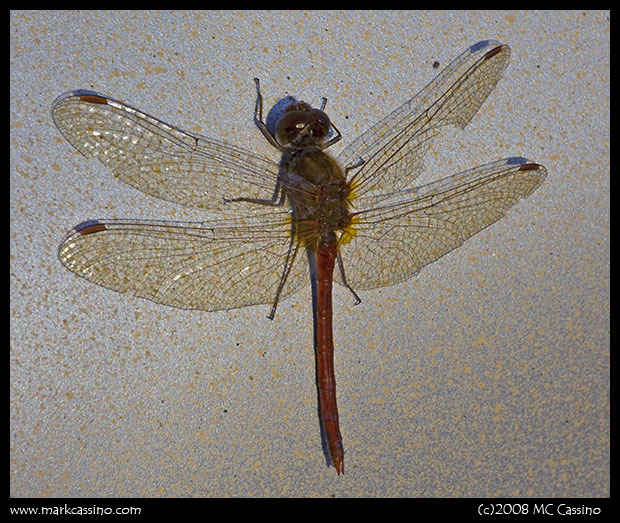 But as I neared my car, I was surprised to see an Autumn Meadowhawk land on the back of the vehicle. A perfect place to soak up the sun’s rays. Another landed, then a few more, and as I watched at least five dragons came to rest on the back of the car. They didn’t stay long, but even without my close up gear I was able to get a couple of shots. Then they flew off into the brown, dried grass and leafless trees and shrubs – to live out their last few days befor the snow falls. So it goes for another season with the dragons. I think about how dragonflies where in the skies with the dinosaurs, hundreds of millions of years ago. They remain today – a primal connection to this planet’s life force. This entry was posted by mcc and is filed under Insect Photography, Landscape Photography, Pictures Of Trees, Midwestern Landscapes, Michigan, Allegan State Game Area, Allegan Forest, Dragonfly Photography, Odonata Photography. I have enjoyed your dragonfly photos. It has been an educative experience to learn of the many species that exist. I will be more attentive next time I see a dragonfly. Love the pictures! I can’t wait until autumn. I have done a tremendous amount of foot trail work in the Allegan State Game Area and it is a great place to hike. Equestrian trails and bike trails also. Just for an update so that incorrect information doesn’t get passed around. Hunting takes place all year round, and according to the Allegan State Game Area staff, there is no reason to stay away from the Allegan State Game Area just because of hunting season. It is a safe place to enjoy the forest activities year round.